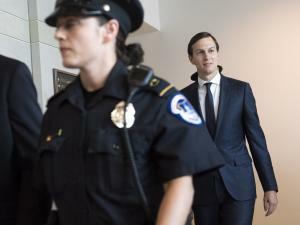 Sept. 25 (UPI) — White House adviser Jared Kushner used a private email account to communicate with White House officials after President Donald Trump was elected, his attorney has said. In a statement Sunday Sunday, Kushner attorney Abbe Lowell said fewer than 100 emails were sent from the adviser’s personal account instead of from his White House account. Most of the messages, Lowell said, included “forwarded news articles or political commentary.” She added that the emails were eventually forwarded, and preserved, in Kushner’s White House official account. Kushner’s personal account was established during the transition period between Trump’s election victory in November and his inauguration in January, Politico reported Monday. However, there is no indication that Kushner shared sensitive or classified information in his private emails. Kushner, the president’s son in-law, is a focus of the government’s ongoing investigation into potential Russian interference in the 2016 election. The Justice Department’s probe has expanded to include possible obstruction of justice by Trump and aides since the start of the administration. Use of private email accounts may contravene the Presidential Records Act, which demands that all White House activities be archived. The issue of government employees using an unofficial email accounts became a substantial issue for Democratic candidate Hilary Clinton in the 2016 presidential campaign. Clinton was found to have used a private server while she was President Barack Obama’s secretary of state, and State Department and intelligence officials asked federal authorities to determine whether any classified material was exposed. Former FBI Director James Comey called her actions “extremely careless,” but ultimately cleared Clinton of wrongdoing. Former chief of staff Reince Priebus, former chief strategist Steve Bannon, National Economic Council director Gary Cohn, and Kushner spokesman Josh Raffel are among White House officials who sent and received emails through Kushner’s personal account, Politico’s report said.